Town Business: Who's Responsible for Illegal Dumping in Oakland? According to a city-funded survey, only 3 percent of illegally dumped garbage comes from homeless camps. The Oakland City Council reconvenes next week with committee hearings following its summer recess. Illegal dumping study: Back in March, Oakland had an environmental science consultant study piles of illegally-dumped trash. The consultant surveyed 75 piles of garbage strewn about the city, marking the location and sifting through rubbish for information about its source. 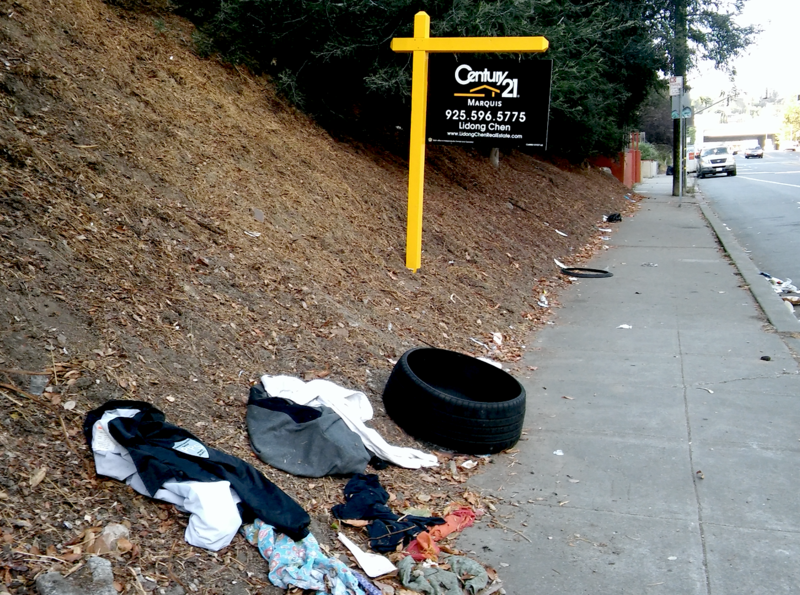 Most of Oakland's illegal dumping comes from residential sources. People are throwing out clothing, appliances, kitchen waste, furniture, and more. This was at least 55 percent of the total. Another 15 percent of street waste is disposed of in what city workers call "neighborhood dump sites." These are locations where people from nearby residences repeatedly throw waste into piles as a custom. Only 10 percent of the garbage on Oakland's streets comes from "experienced dumpers" who haul the waste into Oakland and drop it from the back of trucks. Other non-residential sources of illegal dumping include construction waste dropped by contractors or people working on their houses (8 percent), auto parts and cars (5 percent), and restaurants (3 percent). Only 3 percent of illegally dumped garbage comes from homeless camps. As for where the waste is being transported from, most of it is unknown. There wasn't a way for the researchers to pin an address on its starting point. But at least 29 percent of illegal dumping can be traced back to somewhere in Oakland, more than any other place. The illegal dumping report will be reviewed at this week's public works committee meeting. Should Oakland have a public access channel? : Councilmember Lynette Gibson McElhaney had city staff study the possibility of setting up a public access channel where Oakland residents could produce their own shows, documentaries, and other programs. This week's life enrichment committee will discuss the idea further.